So what is this Coat of Arms thing, anyway? "Quartered: 1st, or; the letter "E" sa. ; 2nd and 3rd, gu. ;a fleur-de-lis arg. ; 4th, paly of 4, sa./or. Charged with a small inner shield vert." Divided into quarters: 1st quarter, gold background; a black initial "E", 2nd and 3rd quarters, red background; a silver ancient heraldic flower; 4th quarter, divided: 4 vert. bands, black and gold. A small green inner shield placed over all. 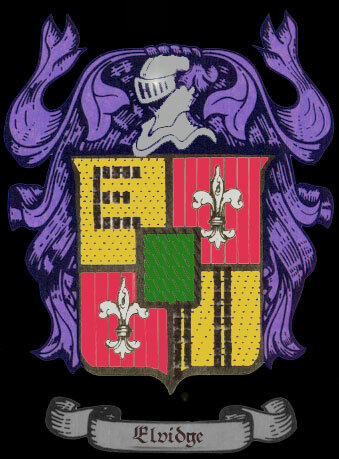 A fleur-de-lis symbolizes faith, wisdom, and valor. Seven vivid colors were chosen for use on shields of armor-clad knights to easily identify them at a distance. The heraldic colors gold, silver, purple, blue, green, black, and red were preserved on colorless drawings by dot and line symbols. The Elvidge coat-of-arms incorporated green. The color green represents hope, vitality, plenty. OK, truth is, some guy at the mall makes a business of creating these things. I have no idea whether or not his database has any factual basis. But, hey, its kind of cool, anyway, isn't it?